← Can your docPrint and docPrint PDF Driver support Arabic characters? Please show me an example. Who can help me translate a German pdf file to English? 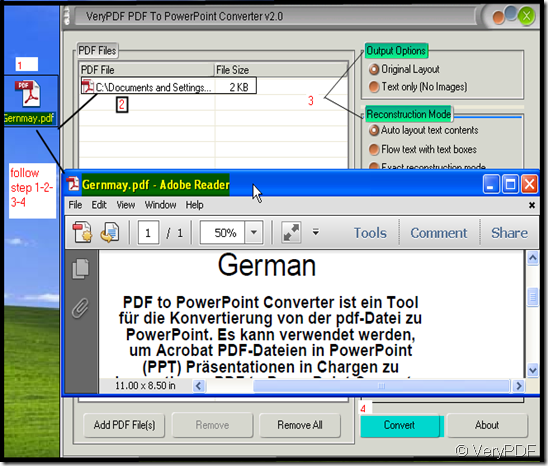 PDF to PowerPoint Converter can translate the German pdf file to English for you. 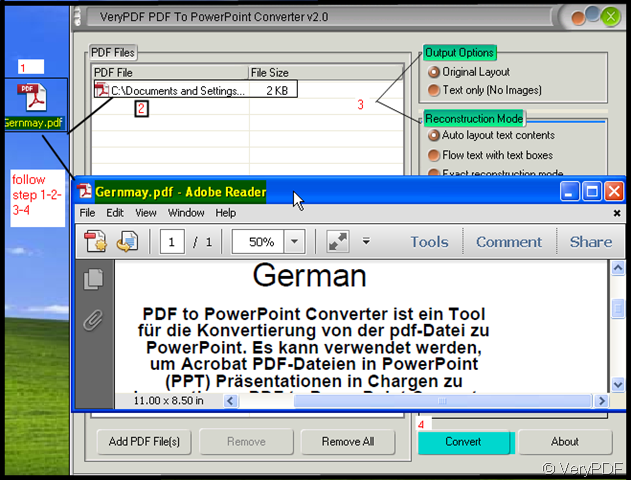 PDF to PowerPoint Converter is a software which can convert the pdf file to editable PowerPoint and it supports nearly all kinds of languages such as English, French, German, Italian, Chinese Simplified, Chinese Traditional, Czech, Danish, Dutch, Japanese, Korean, Norwegian, Polish, Portuguese, Russian, Spanish, Swedish, etc. 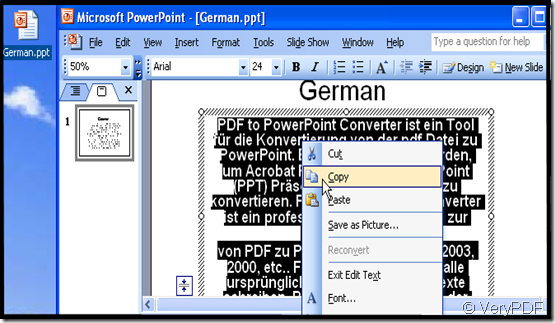 After converting the pdf file to PowerPoint, you can put the text to any translation tools. So I bet you can read the German pdf file by this way. Now I will show the detail ways to translate it. Get this software by clicking here. http://www.verypdf.com/pdf2ppt/index.html#dl Please read the usage and introduction carefully. Enter the interface, add your German pdf file to it and think about the menu options well then choose them. Choose the page range and input the password at the “PDF File” option if the source file has. Convert it and do not forget to save it. Copy the German to the translation tools then you can read it. Then I will show the steps by pictures. I take a German pdf file for example. The content has been shown in picture 1. Please follow the steps as I marked in the picture 1. Then a PowerPoint with the same content in pdf file will bounce to the screen in a few seconds,like picture 2 .The last you need to is copying the content to translation tools. How to convert images to PDF files? How to convert documents of MS PowerPoint to ps? How to get ride of the words on the picture if the picture was saved as the format of PDF? Why I can not edit the images in the PowerPoint which converted from pdf by PDF to PowerPoint Converter?